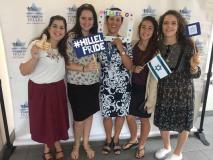 Four young ladies dedicate a year of their national service, to coming to Hillel to infuse a spirit of Zionism and Israeli Culture. These four dynamic girls are involved in creating programming and events that inspire the students to connect to Israel. They also supplement our Hebrew Language program. The Bat Ami girls are responsible to implement a Tzionut curriculum as well as the annual Yom Ha'atzmaut and Yom Yerushalayim celebrations. They also add ruach to our weekly Shabbat assemblies through song and dance. The Bat Ami girls love to get to know the extended Hillel community through Shabbat meals and other events. Please feel free to contact Dalia Golan, Bat Ami coordinator at dgolan@hillelhebrew.org if you are interested in hosting a Bat Ami girl. Hillel is proud to embrace an integrated and innovative program teaching all students to love and nurture our Earth and environment. Issues surrounding sustainability and conservation are most important in every classroom. Our sunny outdoor Atrium is full of lush, vibrant fruit trees tended by our young gardeners. Wooly Pockets adorn several walls throughout the entire campus, both indoors and out. These Pockets are full of fruits, vegetables, and other beautiful plants and ecosystems. The Wooly Pockets are Hillel's own school-wide sustainable gardening program. Outdoor education trips to Pali Institute in Lake Arrowhead, Catalina Island, and Oregon take our students beyond the walls of a classroom to experience nature's awe in an entirely different and unique setting. The Student Council serves as our Green Team, helping to educate the community on important endeavors such as recycling and conserving energies. The School's participation and support of Heal the Bay's beach clean-up and adoption brings our entire community together for a powerful, yet fun event at the Pacific Ocean. Our "green" curriculum is one we're proud of, and encourages all students to appreciate and understand the importance of environmental stewardship and sustainability. Our students are empowered to be ambassadors of Mother Nature and explore what each can do at home, the community, and the world to help preserve Earth's natural resources for future generations. Dr. Glass graduated with a Doctorate in Education from USC and a BS in Psychology from UCLA. She was awarded the Pupil Personal Credential and School Psychologist Credentials, as well as the License in Educational Psychology. Dr. Glass has been the on-campus Educational Psychologist at Hillel since 2006. She oversees the Gifted and Talented Program at the school. The best to way to contact her is via email at: eglass@hillelhebrew.org. Judy Pollick has a Masters in School Psychology, has credentials in school psychology and school counseling, is a licensed educational psychologist and certificated teacher. She has worked as a school psychologist in England and Canada as well as for LAUSD. Judy will oversee the Student Study Team and facilitate supports needed for students. She can be reached at jpollick@hillelhebrew.org. Hillel's Gifted & Talented program, the first of its kind among Orthodox Jewish day schools on the West coast, makes challenging and appropriate educational materials available to identified gifted students throughout the day. By means of curriculum modification, differentiation and certified staff educators, students receive appropriately challenging instruction throughout the day. Hillel recognizes its partner, the University of California San Diego, in training its staff to lead this much-needed and successful program that serves so many students. This is the national number for an excellent organization that provides information to children and families with ADHD and can be an invaluable source of information and referrals. Morah Katherine Simon is the Director of the Harkham Hillel Hebrew Academy Choir, and she teaches 3rd and 4th Grade Judaic Studies. She graduated from UCLA and specialized in Social & Developmental Psychology as well as Special Education. She also has a background in musical production. Morah Simon has been teaching at Hillel for 6 years and her teaching career spans over 13 years. She loves getting students excited about learning through art, music, cooperative learning, reading and writing. Morah Simon can be reached at ksimon@hillelhebrew.org. Cantor Arik Wollheim, born and raised in Israel, has served as Chazan of Beth Jacob Congregation in Beverly Hills, CA since February 2013. In addition to leading Shabbat and holidays services, Arik directs a volunteers’ choir, is involved in various capacities with teaching both adults and youth, and is fully immersed in his pastoral duties such as attending to those in need or cultivating new membership. Cantor Arik's accomplishments include winning the famous Hassidic Song Festival in Israel, being a scholarship recipient of the American-Israel Cultural Foundation, winning the Sharet Competition and being selected a member of the International Vocal Arts Institute conducted by the Metropolitan Opera House in New York City. In 2004 he released his solo CD, “Return to Zion”, a collection of Cantorial works accompanied by a full Symphony Orchestra. Andy Chagi, Music Director, has been teaching music in the classroom for 32 years. He has presented classroom presentations to full Broadway musical shows with a choir and orchestra. Andy holds a Masters degree in piano performance. He loves to inspire his students to reach a high level of learning, whether it is playing a instruments or singing a song for a presentation. Andy can be reached at achagi@hillelhebrew.org. The Choir meets for rehearsal every Friday from 11:20-11:50pm in the Music Room. In the case of choir practice cancellation, parents will be notified via email 24 hours in advance. Email ksimon@hillelhebrew.org for more information.